Surprise! IKO IKO is moving. We will be permanently closing our Fairfax location in West Hollywood as of Oct. 25 while our future home is in the final making. More info to follow soon. Please visit www.ikoikospace.com. 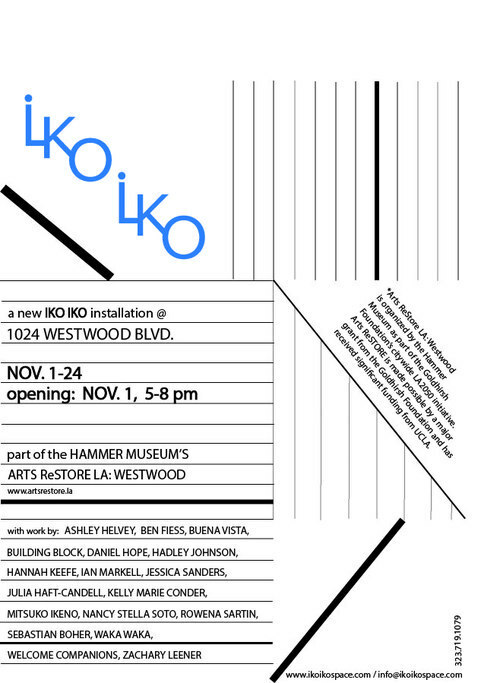 November 1 marks the beginning of our special storefront installation at 1024 Westwood Blvd, as part of the Arts ReStore LA: Westwood. We will be transforming the space with a new conversation of ideas. With work by: Ashley Helvey, Ben Fiess, Buena Vista, Building Block, Daniel Hope, Hadley Johnson, Hannah Keefe, Ian Markell, Jessica Sanders, Julia Haft-Candell, Kelly Marie Conder, Mitsuko Ikeno, Nancy Stella Soto, Rowena Sartin, Sebastian Boher, Waka Waka, Welcome Companions and Zachary Leener.